This is one of my favorite weekday meals because it is healthy, easy to make, and can be made with a variety of ingredients. 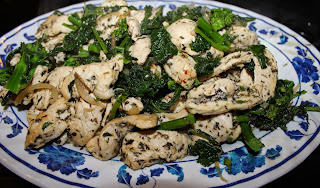 The star is the broccoli rabe which holds up well to the garlic and chili flakes. I prefer doing this with chicken, but you'll see Italian restaurants follow a similar recipe without protein, with chopped up sausage, with potatoes, or with a combination of ingredients. Many recipes call for dunking the broccoli rabe in an ice bath after blanching in order to stop the cooking. Personally, I find this step unnecessary so long as you are going from blanching to sauteing right away. Boil water for blanching the brocolli rabe. Saute chicken in olive oil until brown and cooked. Remove from the pan. Add the broccoli to the boiling water. Meanwhile, saute the garlic. Let it brown, but not burn and remove the pan from the heat if it is burning. Blanch the broccoli rabe in the boiling water for about two minutes, then strain. Shake out as much water as you can before. Add chili flakes and broccoli rabe to the pan and saute 2-3 minutes. Add back in the chicken. Add salt, pepper and saute 2-3 more minutes. Serve hot. This is a back to basics recipe with few ingredients, easy preparation, and quick cleanup. Sometimes you just have to go back to the basics, which is what I was reminded of when I visited my daughter's first grade classroom. Afterward, I wrote about What Agile Teams Can Learn From a First Graders.